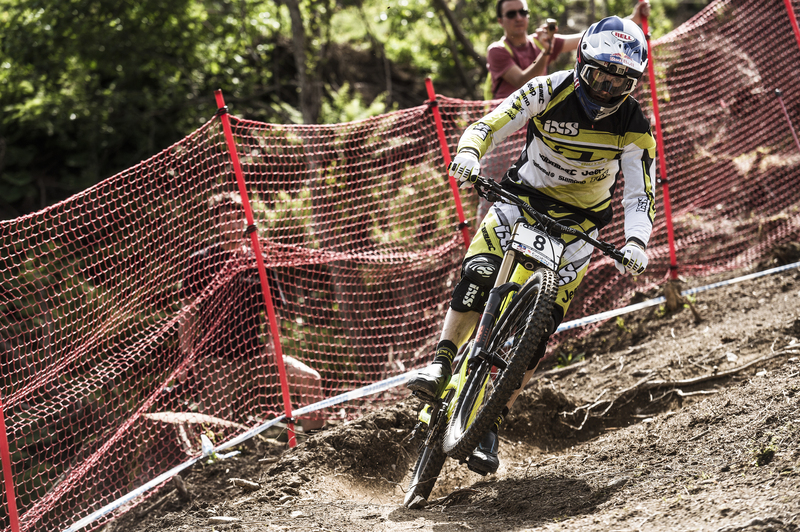 Mountain bike history was made in Leogang this weekend. Aaron Gwin lost his chain just outside the start gate — much as Neko Mulally had done in the 2014 World Champs — and incredibly still went on to win. Gwin remained off the brakes, hitting an incredible 56kmh through the speed trap to take the win over second place Connor Fearon by just under half a second. 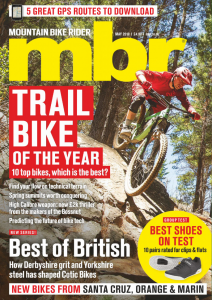 Could it be that the chainless drivetrain is the biggest tech breakthrough of the year?! 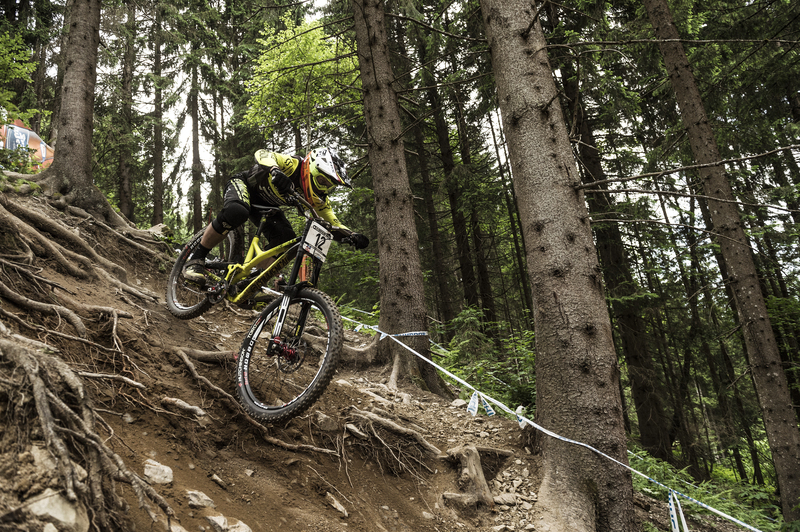 Gwin has been down on his luck more than once in Leogang, starting in 2012 when his brakes failed and continuing last year when he rode down the hillside on only his rim, having punctured further up the course. 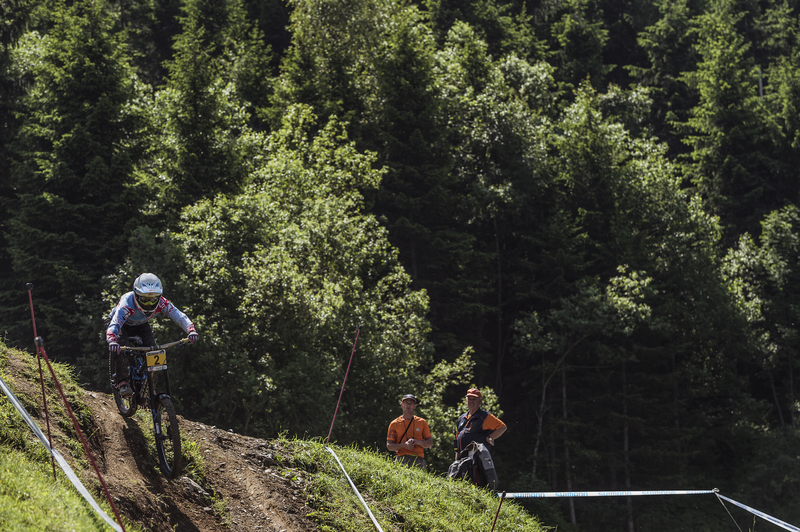 There was no shortage of drama in Leogang when earlier in the day Manon Carpentor was disqualified for breaking the course tape before re-entering at a different point of the track. The earlier runs were plagued by high winds and Carpentor was blown offline on the final jump, resulting in a brutal disqualification mere metres from the finish line. Her curse continues it seems, with the world champion yet to finish a round with a run she can be satisfied with having crashed hard in Fort William and looking off the pace in Lourdes. Tahnee Seagrave looked quick out on course, but her time wasn’t fast enough to hold off the formidable Rachel Atherton who came down first whilst Emmeline Ragot managed 3rd place. 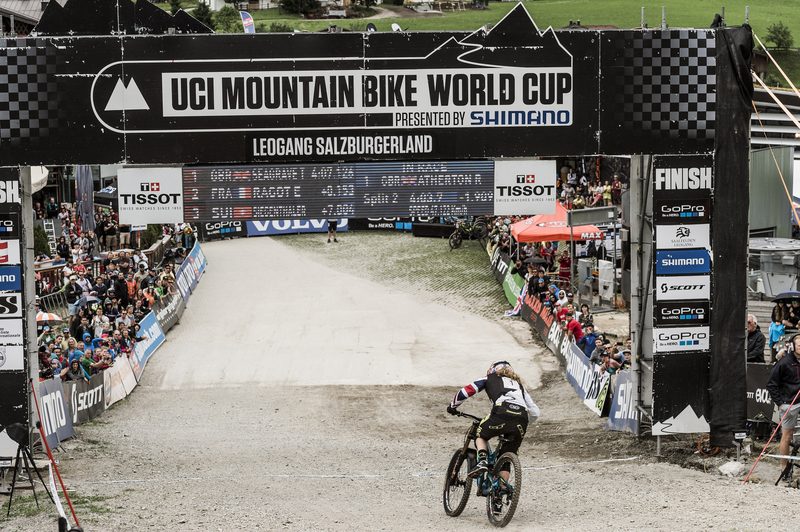 Seagrave, who desperately wants her first world cup win couldn’t best Atherton, who came down the hill fastest and is beginning to look dominant on the circuit this year with back to back victories at Fort William and now in Leogang. 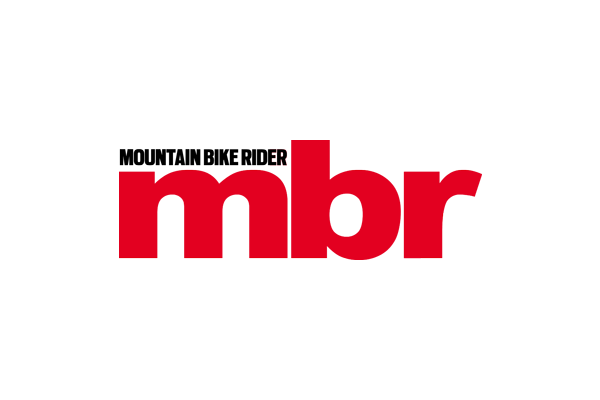 The course underwent a redesign for this year’s race after many racers complained about it being a bit too like a bike park for their liking. 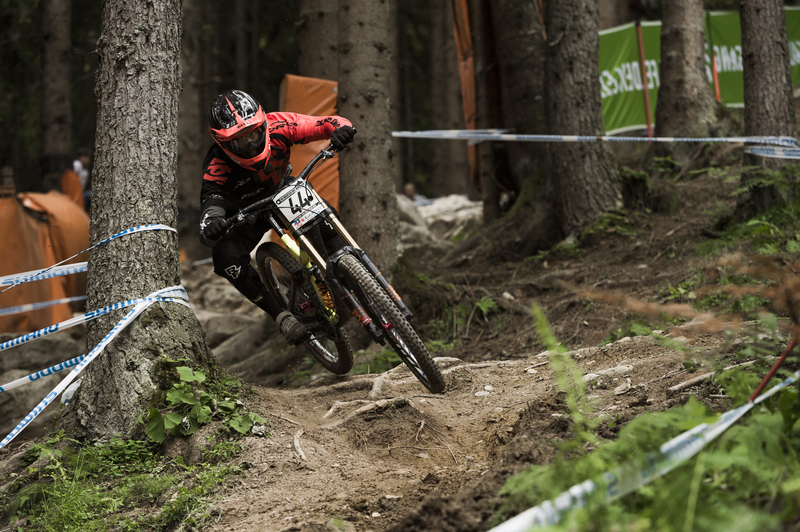 With its big jumps and large berms it was undeniably more sculpted than the other world cup tracks so some fresh corners and wood sections were cut in to give it a more natural feel. A mixture of the large summer storms and the number of riders meant the course really opened up over the weekend, revealing a web of roots and ruts, and leaving the final course looking much different to that of the one seen in the course preview video and an altogether different beast from that of the previous years. The ever changing course coupled with high winds made for tough early racing and Loic Bruni remained in the hot seat until Troy Brosnan toppled him. With the winds dying down on course the riders started coming through in ever greater speeds, without having to wind tuck they were able to throw some pedal strokes in and gain an advantage on the more pedally jump sections (not that this mattered, as Gwin devastatingly demonstrated). The podium this weekend was filled with fresh faced youngsters with great results for Connor Fearon, Remy Thirion and Troy Brosnan who took 2nd, 3rd and 4th respectively. 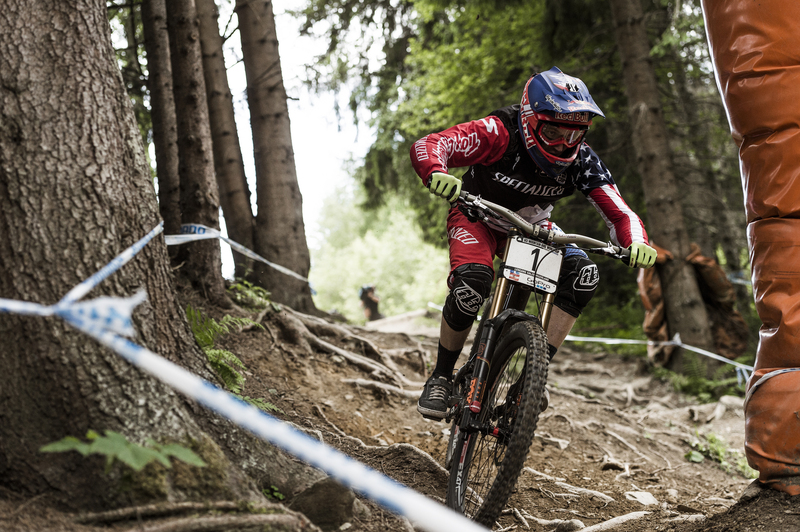 The relatively sage Greg Minnaar followed his Fort William win with a fifth place. Whilst Josh Bryceland was off the back of the podium in 7th place he seemed to be riding much more like his old self; gliding over the rough root and rock sections, looking smooth all the time despite the fact he was suffering from a partially separated shoulder following his crash at Fort William. 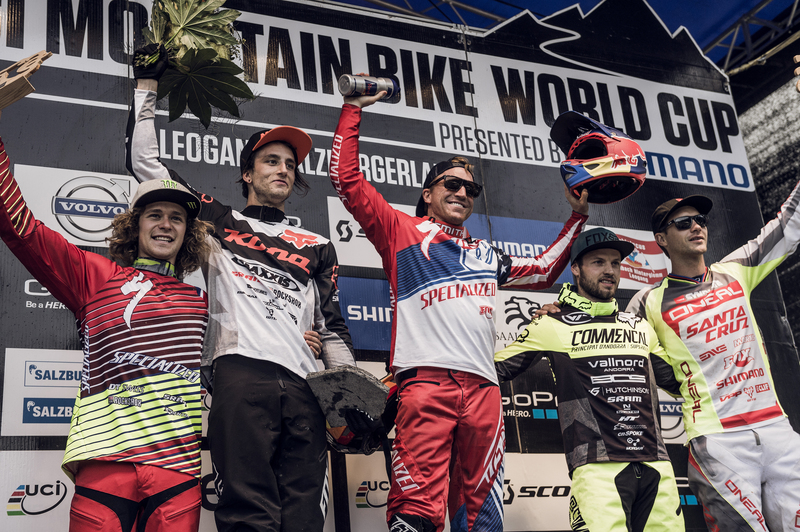 The world champ Gee Atherton also failed to get his cylinders properly firing, coming home off the podium in 6th place, whilst last week in Fort William he could only manage 5th.